I had such a hard time waiting until after Halloween to release this pattern. 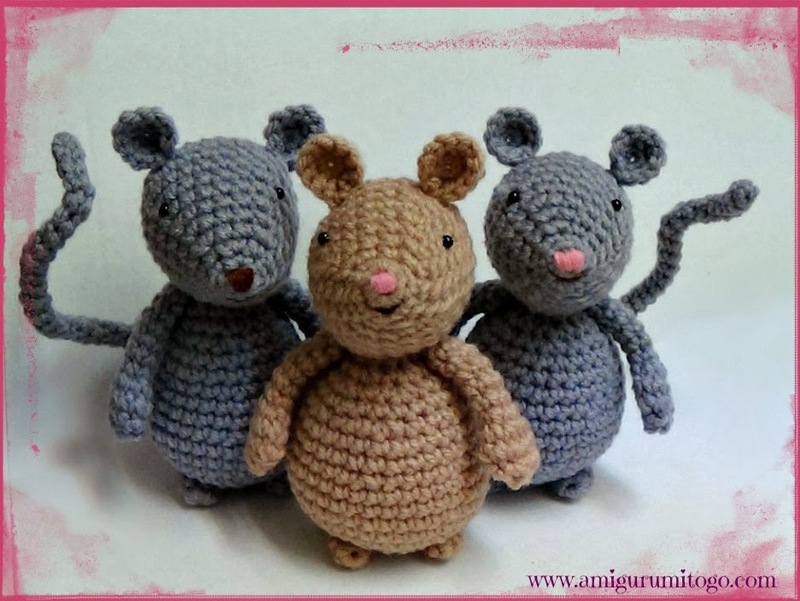 I'm in love with all the mouse characters I've ever read about in children's books and seeing them come to life in the form of amigurumi is so much fun! Special notes: I worked in continuous rounds with a 3.75mm hook and worsted weight yarn. Have any questions or if you come across a mistake in the pattern please leave a message in the comment section below. This pattern will give you a Mouse about 5 1/2 inches tall depending on your choice of yarn and hook size. How to read the rows: Each row has a sequence as given below. For example 1sc then 2sc in next st means repeat that sequence 1sc then 2sc in next st followed by 1sc then 2sc in next st over and over to the end of that particular row. The number inside the parentheses ( ~ ) is the number of stitches you should have at the end of that particular row. *if you use safety eyes they can go in after you've completed row 11. I put the ones you see pictured in between the 7th and 8th row with 6 stitches between them. Make sure you are happy with placements before securing anything in place. You can also whip stitch the nose in before stuffing and closing the head, see pictures below. 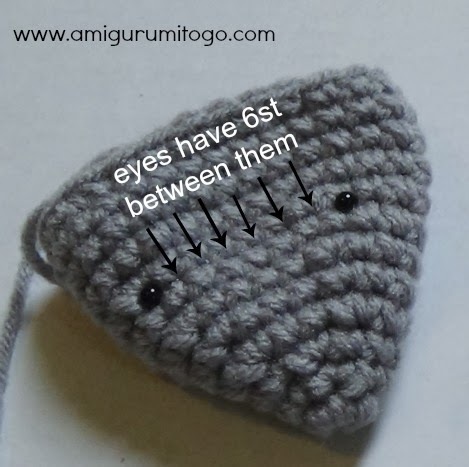 The ears are placed on the 10th or 11th row in line with the eyes. These can be sewn in before or after you close up the head. It's what ever you find to be easier for you. If you want to sew them in before then do it after you finish row 13 of the head, see pictures in the Ear pattern section. Use a sewing needle and embroidery thread, go inside the head and out where you want the nose. Do a series of whip stitches until you are happy with how the nose looks. Use a couple whip stitches to put in the mouth as well. Once you are done turn the head inside out and knot off your thread ends. *we start with the nose so keep the stitches as tight and neat as you can. Also be sure to finish off the last few rows as neatly as you can as this will be the back of the head and it will be visible. 14) 1sc then 2tog (12) *good time to stop and stuff the head. sl st next st and f/o leaving a long tail for sewing. Use a yarn needle and weave the yarn tail in and out through the last 8st. 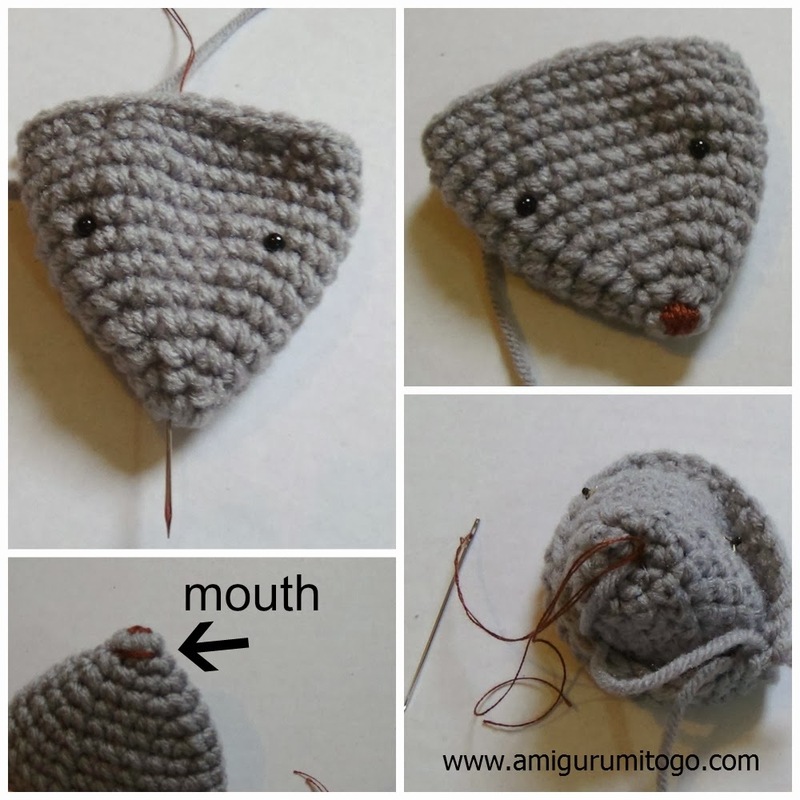 Pull until the gap closes, neatly knot off and carry the yarn tail inside the head to hide it. f/o leaving a long tail for sewing. Pinch together the bottom of the circle where you just f/o, put in a couple whip stitches to hold the shape and knot off. sl st next st and f/o leaving a long tail for sewing. Do not stuff. Sew in as pictured and don't pull the yarn so tight that you alter the shape of the foot or body. sl st next st and f/o leaving a long tail for sewing. Sew as pictured. If it is too much of a struggle to work in a circle with only 4st then please refer to the video where I show how to make an alternate tail with a chain. I hope you enjoyed the pattern and got yourself a little mouse made. Please show off pictures of your finished mouse on my facebook page Amigurumi Freely. I can't wait to see them! Donations of any size are greatly appreciated and help keep the patterns free. If you do give a donation, please except this note as my sincere thanks and know that you have helped a great deal. Thank you so much for sharing this lovely pattern! I'm looking forward to making a mouse for myself. 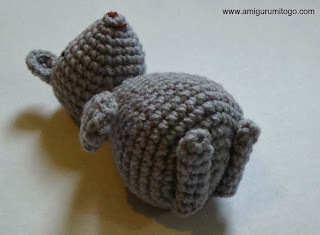 Thanks for sharing this pattern - so sweet! I love this pattern!!! Thanks so much for sharing! I love your patterns! These mice are over the top cute! I have one question, Do have to crochet them as tight as you do for them to come out good? I hear the yarn squeak against the hook and my hands start to ache. Keep up the good work! This pattern is really beautiful! I like this so much and I'm trying to do this :D I have a question. Can i repost this pattern in my blog? I will link back to original post. Hello! I'm glad you will be trying the pattern. I'm not sure if you meant re-post the whole entire pattern or the link? If you meant re-blog the entire pattern then no but links back to the pattern are appreciated. Thanks so much for asking! Hi Ichipooh, I seen the translation and it's lovely. I realize I said keep all parts as they are but I meant the written pattern and you can use your own photos. You can post a picture of your own mouse for sure :)) Sorry for the misunderstanding! I just updated the pattern and added your link plus I added a label on the side. I will also share on my facebook page, I'll let you know when I do that :)) Hope to see a photo of your mouse ~ have a great day! Thank you for your lovely mouse pattern. The first mouse emerged late last night and I love it. Now I see you jave Christmas gear and I can't wait to get back to crocheting tonight. There will be a Christmas mouse in the house! Geweldig dat je al die leuke patronen aan ons laat zien , dank je wel. awww, that is so awesome to hear! It's just a light grey and a beige but I don't keep the color codes since colors vary depending what brand you use and also some places don't carry the brand I use which is Red Heart. Any color will work really. On my facebook page there have been a dozen or more posted now by others and they used every color you can think of. I just died of cute! These are absolutely adorable!! I'm making a set for my niece and nephews complete with Christmas capes for Christmas next year! Thank you for so generously sharing your pattern! Amazing! Thank goodness I found your pattern. I'm planning on making two of these and dressing them up as Jaq and Gus for a Cinderella obsessed friend of mine. So thank you!! But I would like to make it smaller (about 1/2 yours). 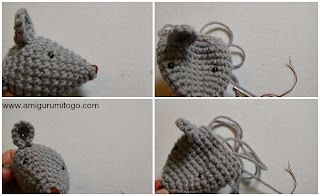 Could you help me to find the correct hook and yarn? Hola Sharon, me gustaron mucho tus videos y patrones, sobre todo los de ratoncitos, quiero pedir tu autorización para traducir al español y publicar en mi blog, diciendo que el patron es tuyo, por supuesto. Yes you can. Please provide a link from your blog back to this pattern. When the pattern is ready I will link to you as well. Sí se puede. Por favor, proporcione un vínculo desde su blog de ​​nuevo a este patrón. Cuando el patrón está listo pondré un enlace a usted también. Hola Sharon, gracias por el patrón. Me gustó mucho el ratón y pude hacerlo para mi hijo. With a little more effort, I found the mice instructions, thank you so much!! Were did you purchase the 4.5mm eyes?? For the tail, you can use a "tricotin" (I don't know the word in english), it will be much easier. Whatever makes it easier for the individual. I think that word means i-cord? If so, yes an i-cord will work and also a chain works or crochet a couple rows and roll it up. Is there a way to make the head bigger so that it will fit with the Dress Me Bunny body? I think a mouse would look adorable in those dresses! I love this little mouse, but my arms are not coming out like the picture. I did them twice and mine are stubbier and fatter than yours! I guess I will just have to figure out a skinnier alternative lol. Hi Sharon, you developed lovely creations! I am aware that it is prohibited to share your patterns at internet as copy/paste, but I am wondering if it is allowed to share links at internet (social media etc)leading to amigurumitogo.com with you patterns, for instance leading to this page? So that more people can visit your site en enjoy your creations.